This title is a beautiful sample quilt featuring traditional and original block designs inspired by popular Bible stories. 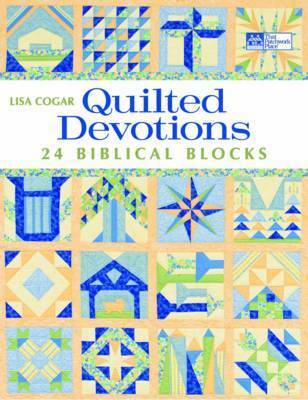 Inspired by well-loved Bible stories, "Quilted Devotions" is a quilt sampler of many colours - and many possibilities! Choose from a selection of 24 gorgeous blocks, including rotary-cut template, and paper-pieced designs, that can mix and match. Featuring both traditional blocks, such as Jacob's Ladder and Bethlehem Star, and original blocks specially designed by the author, as well as an attractive photo gallery for ideas and alternate settings, this is the perfect quilt for those looking for a little inspiration. Lisa Cogar is an accomplished and popular quilting teacher who has a passion for sampler quilts.